March | 2010 | eat. drink. cook. travel. 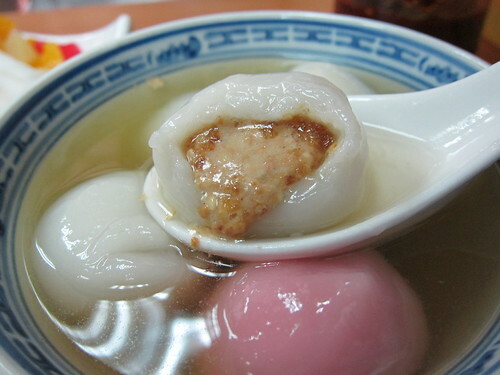 Mei Heong Yuen is famous for its excellent desserts. The standards are still high despite its popularity and the sheer volume of people and corresponding desserts passing through. I went for the tang yuan in ginger soup. The glutinous rice balls were soft and chewy and came in black sesame and peanut flavours. I liked the peanut one more as the filling had bits of crunch while being just the right sweetness. It contrasted nicely with the spicy ginger soup. Such traditional comfort food for me. 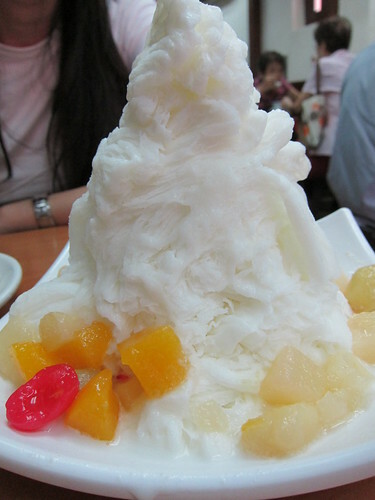 Slightly less traditional was the shaved ice that was new to the menu. I like how they took a new-fangled idea and made it their own with the almond snow ice. It’s basically a block of their signature almond cream frozen and shaved into delicate layers. Same familiar flavour, quite a different and incredibly novel texture. I liked how the very slightly grainy almond layers melted in the mouth. I’ll definitely be there again soon, sooner if it’s a hot day! Remember that place I told you about before? I think it’s time to let the cat out of the bag. This place needs recognition. It’s run by an old couple in a Banda Street food court. Not sure where Banda Street is? 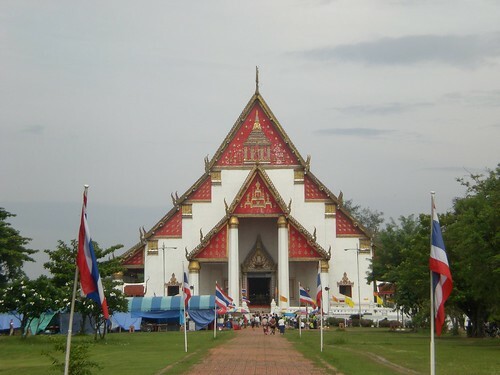 It’s the place overlooking the carpark next to the Buddha Tooth Temple, kinda across the road from Maxwell Market. I went back there with Delightt and this time we brought our men with us. The fish head beehoon was as good as ever, perhaps better this time as the beehoon was perfectly done. 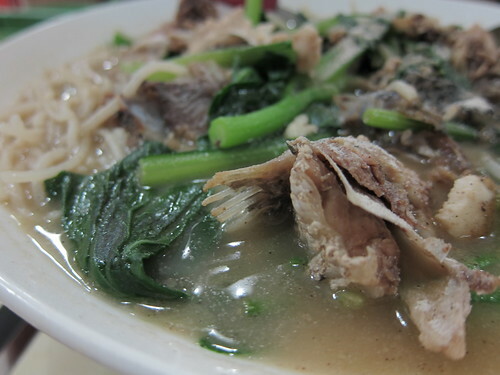 I liked how the soup was still cloudy with no milk added and plenty of good flavour from the fish head and bones. It was hard to eat the fish pieces because tongue had to navigate between fishy grooves to find tasty meat and spit out the spent bones. It was one of the few places where the second visit after so long was better than the first! 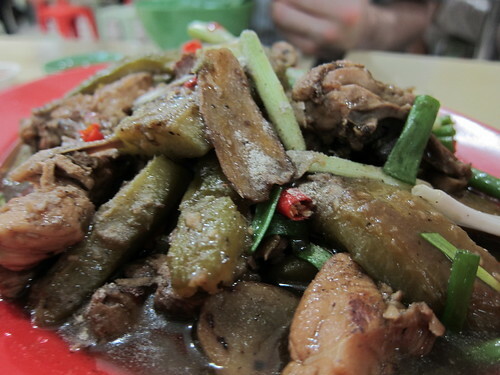 The nice stallholder auntie recommended chicken with bittergourd and black bean sauce. It was good too! 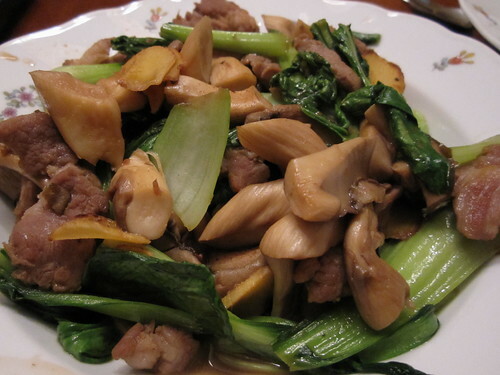 There was plenty of wok hei in the dish and both chicken and bittergourd were well-cooked. The chicken was tender and just cooked through while the bittergourd was nicely braised yet not too soft. The chef has real mastery over his fire here! Come here for good Cantonese fare, just be prepared to wait as there are lots of regulars and the old man at the wok isn’t very quick on his feet. DC and I were frustrated in yet another attempt to eat at Ippudo. Disheartened by the queues, we headed over to Wild Honey instead. It’s an interesting premise here: an eclectic set-up with odd-sized tables and chairs or sofas, a chalkboard menu with pictures to browse on an iPod Touch, and an emphasis on breakfast food. I was a bit surprised to have to queue and pay at the counter for my food, but soon understood as part of the fun was deciding what to eat from the photos on the iTouch. True to its name, this place had several honey-themed drinks. 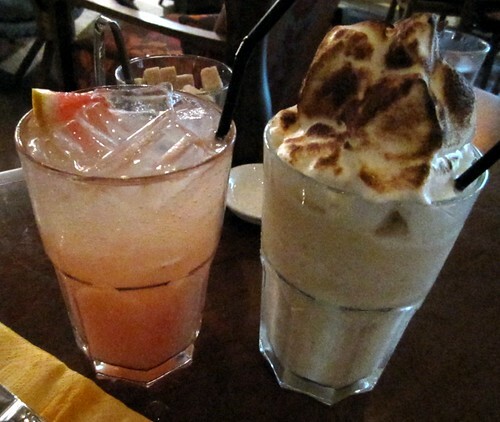 I liked my refreshing fizzy pink grapefruit and manuka honey drink. DC also liked his banana, honey and meringue drink which was more smoothie than drink. It was like breakfast in a glass. I found it way too thick and rich and while I don’t particularly fancy soft meringue, I liked the creativity of the soft meringue topping crisped on the outside (most likely with a blowtorch). DC enjoyed it thoroughly, enthusiastically sucking up the gloop with the straw. The goat cheese salad was another hit. Hardly healthy at all, our token nod to vegetables was dominated by the very yummy breaded deep-fried goat cheese. The oozy, salty goodness went really well with the bacon bits and pine nuts. 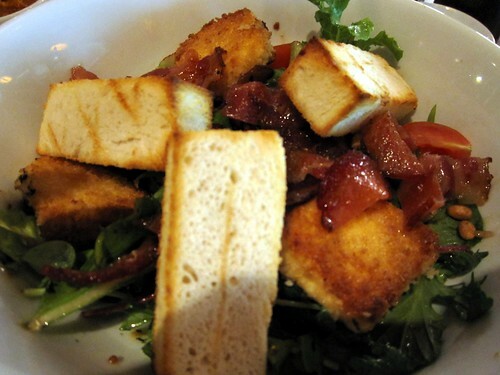 It seemed like the fresh salad leaves were an afterthought. I went for the Yemeni breakfast of “malawach with whole boiled egg, green chili harissa and tomato kasundi.” Turned out that malawach is a Yemeni version of roti prata, very similar to a fluffier version of the frozen kind you pop in the toaster oven to reheat. It came with a loh neng, seemed just like braised egg in soy sauce, but I had no idea what the sauce was. The harissa was quite spicy hot and the tomato kasundi rather sweet. The owner came over and explained to me that it was his favourite childhood breakfast and he was absolutely delighted that I’d ordered it. 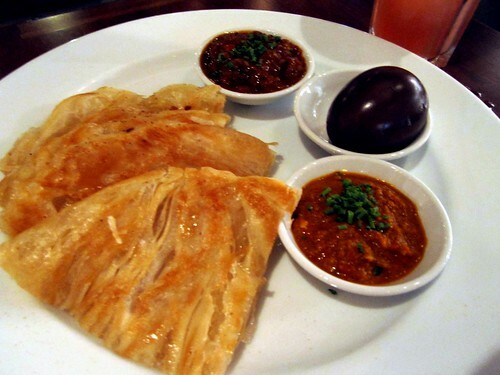 He taught me how to eat the dish: by mashing up the egg and then mixing the sweet and hot sauces to my liking and eating it all with the prata malawach. It was quite yummy, but I felt it quite expensive ($18) for what I got. DC’s choice was more substantial and I rather preferred his Tunisian breakfast of a “sizzling pan of tomato stew, fried eggs and chorizo sausage.” Given that we were having dinner, this breakfast dish seemed more apt for the time of the day. 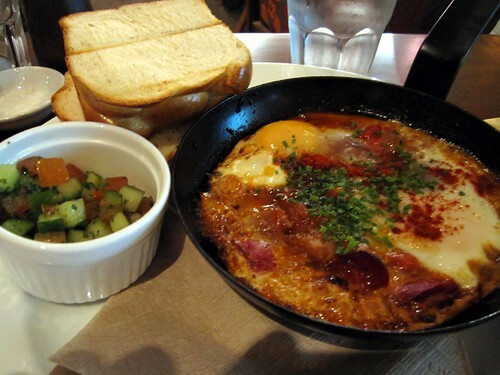 I liked the combination of gooey egg yolk, salty spicy chorizo and tomato on toast. They were somehow a bit nicer on the toast soldiers that came with the salad. My verdict? I guess I’m not much of an all-day breakfast girl. It’s a nice little place with friendly service and interesting concepts. I wonder if it’ll last in fickle Singapore, especially given the high prices (think about it: eggs and bread for slightly under $20?). Still, I’d go back for brunch and try the other stuff too. 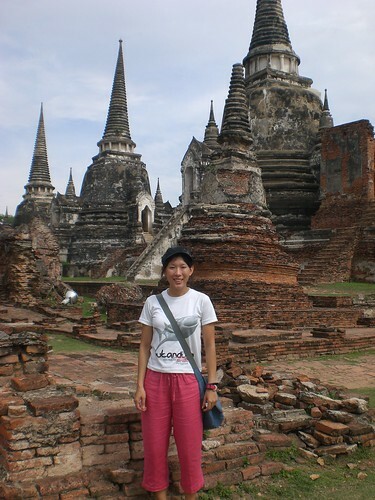 It was our last day in Ayutthaya and I went wandering the streets on my own while Tom recuperated from the heat. 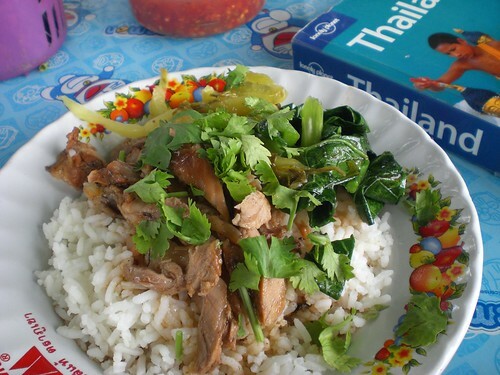 Along a shady area between wats, I found a little food stand and sat down to a simplet yet fabulous lunch of braised chicken with preserved salted vegetables, lots of herbs and incredible chilli sauce. Of course, all the ordering was done in sign language and it helped that I peeked at what other people were having before sitting down. There is nothing like street food for tasting what the locals eat and nothing like street food to have the true taste of a country. I wandered past the temples again, this time slowing down to take in the views. 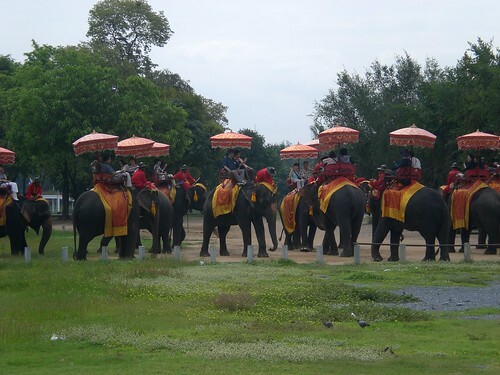 Outside one of the bigger temples, I spied a group of elephants from afar. 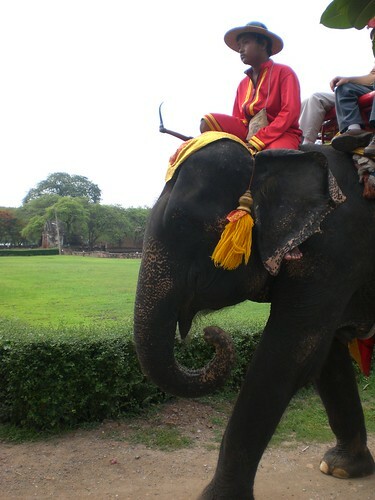 The getup of the elephants was supremely touristy but somehow apt and nicely atmospheric for this city. 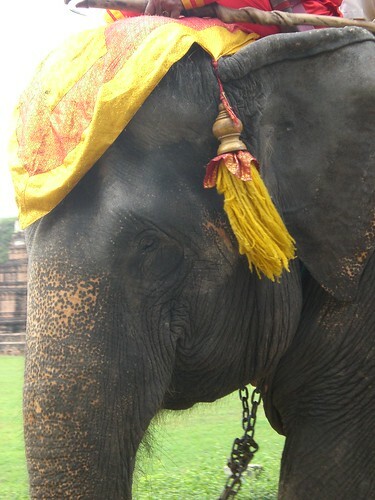 The elephants looked so grand in their brocade and tassels. 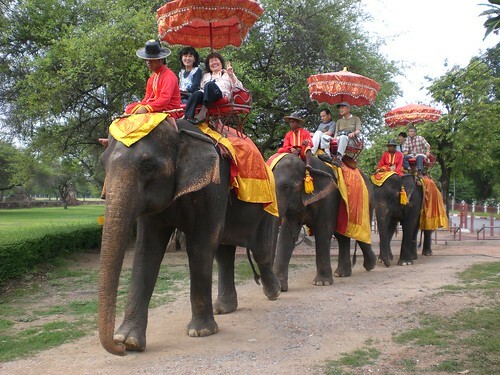 The mahouts perched on the elephants’ heads wore matching red costumes. 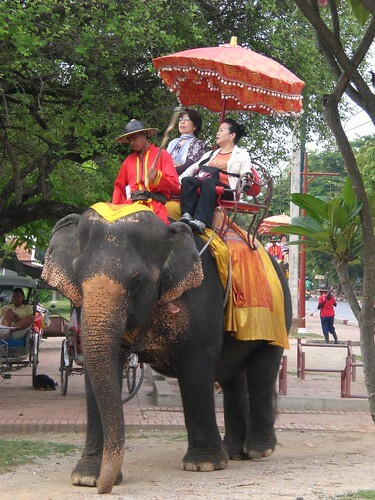 And the tourists (Japanese?) posed cheerfully for my shots. They formed a very grand retinue, such a lovely sight all together. Soon, they ambled off as a group and it was time for me to go. 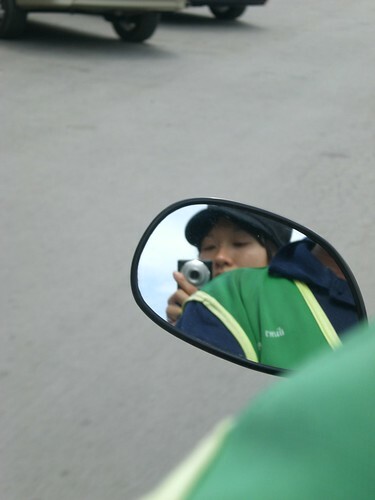 I approached a nearby motorcycle-taxi driver, negotiated my price, and off I went back to the guest house to meet Tom and get to our next destination. 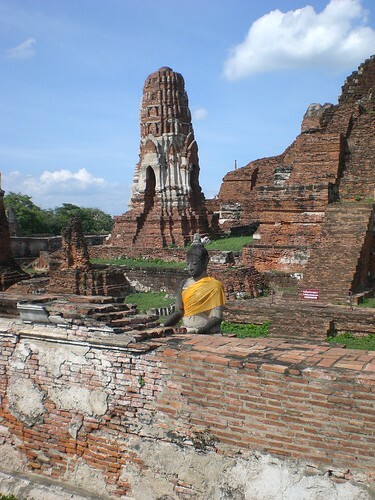 The rest of Ayutthaya was a blur of temple after temple. 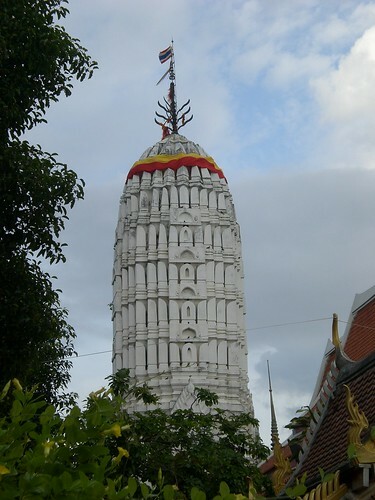 Some of them were still in use as places of worship such as the one here undergoing renovation works while still having devotees throng the area. 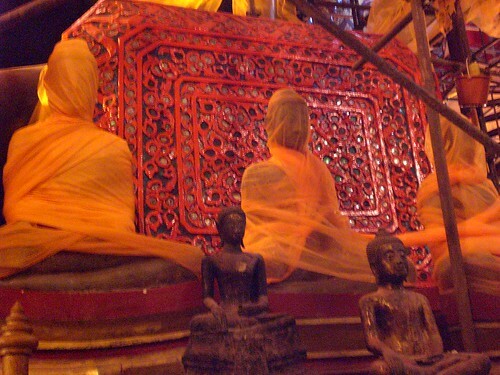 The Buddha images were completely wrapped in orange gauze to protect them from the reno works. 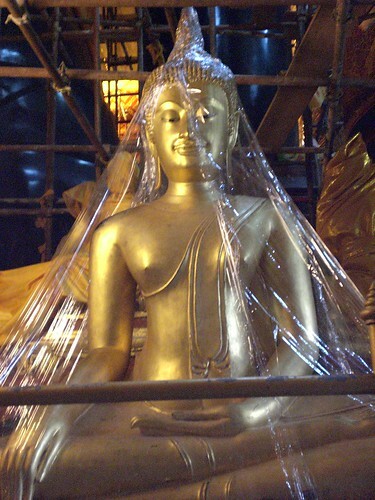 Bizarrely enough, some warranted even more protection, such as this shrink-wrapped Buddha image. 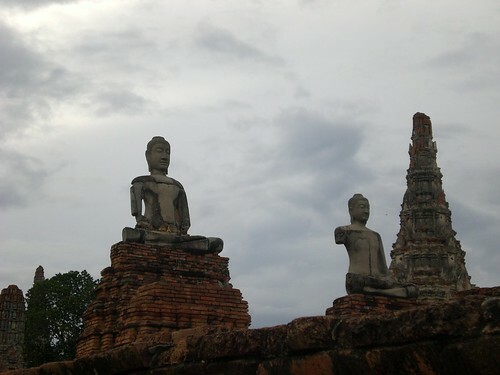 … and more weather-beaten Buddha images. Tom and I were lucky to get this photo. The boat took us to the bank and we didn’t realise that the boat ride covered, well, only the boat road and not admission charges. Thankfully no one noticed us till we’d taken the picture. After being discovered, we had to take a circuitous route back to the boat to avoid paying the fees! The last stop was the former Royal Palace, a lovely building quite austere in contrast with other royal palaces I’d seen. 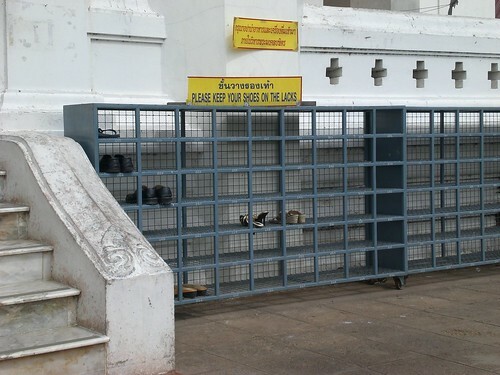 Before going in to see the giant golden Buddha, we had to put our shoes in the lacks. 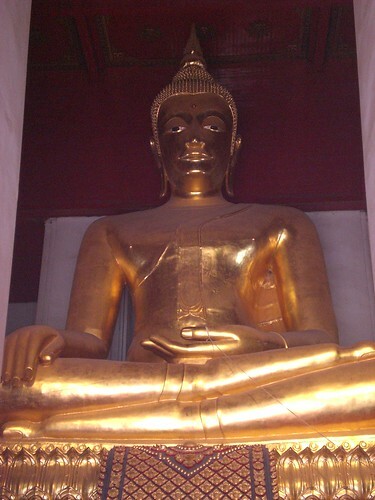 Only after noticing the lacks were we able to view the golden Buddha in all its majesty. 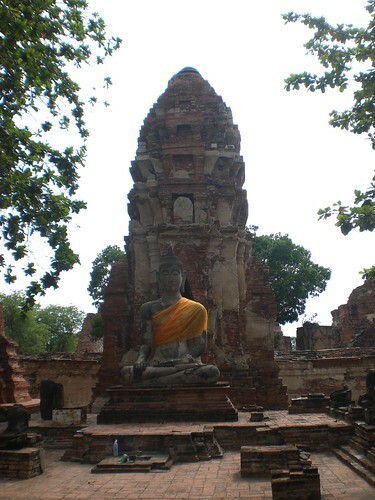 First on the temple circuit (in my books at least) was Ayutthaya. 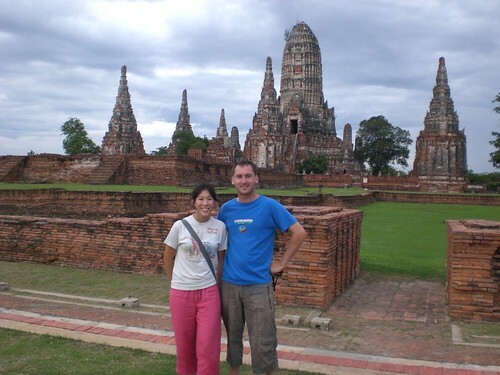 Tom and I decided to travel together up to Chiang Mai and we caught an uncomfortable minivan ride from Kanchanaburi up to Ayutthaya. 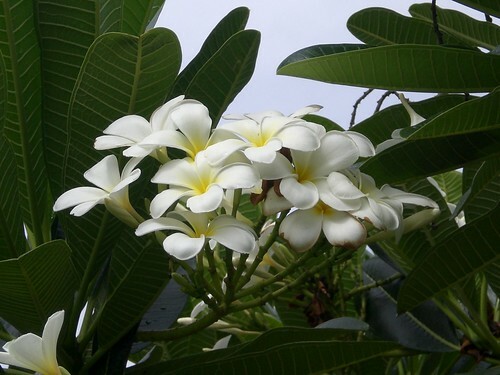 It’s an ancient town situated pretty much within an island formed by the confluence of three rivers. 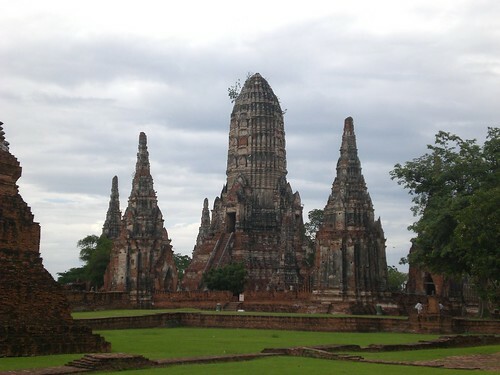 Most of the ancient temples were on the island, but there were some interesting ones on the other side of the river. Our first stop was on the island. 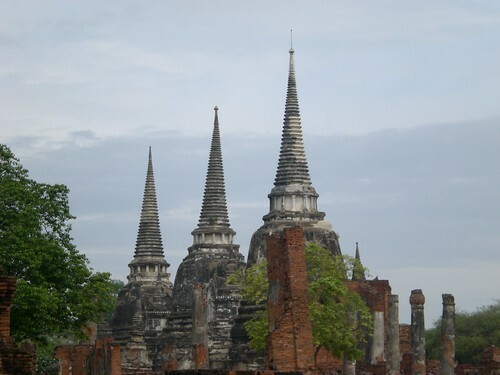 Wat Phra Mahatat contains the most photographed trio of stupas in Ayutthaya, its graceful peaks still pointing straight up into the sky after so many hundreds of years. I like how the brown brick weathered off the top of the structures to reveal the grey material within. It made them look more austere and elegant. There’s quite a lot more to see in the area. 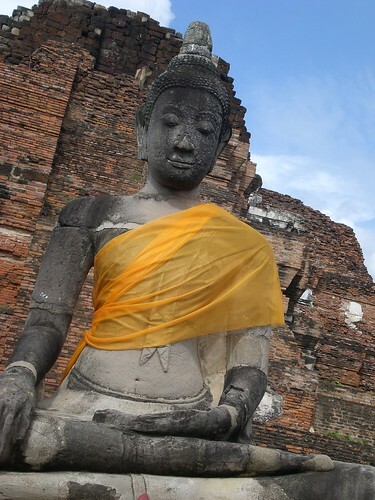 Even though most of the wats were in ruins, the Thai still venerated the Buddha images by placing orange sashes on them. This particular image still retained its serene expression and quite a bit of detail despite being exposed to the elements for so long. Behind it were some tall stupas. 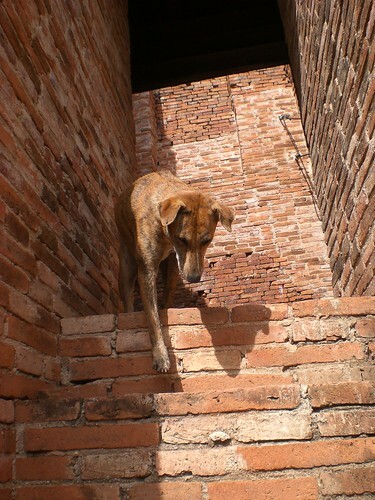 Coupled with the tall stupas were of course incredibly steep steps that even this local dog had to tread carefully down. There were plenty more Buddha images all over, each in a unique pose. 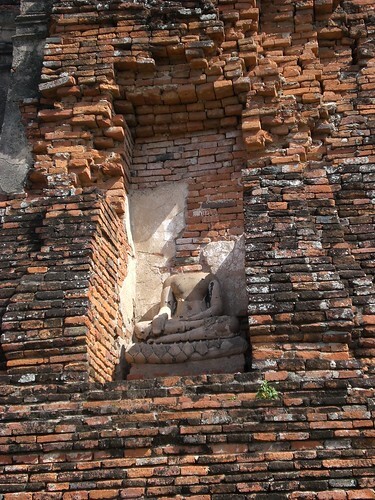 I also spied among the ruins this odd Chinese-style Buddha that looked like it’d been planted there by a tourist. 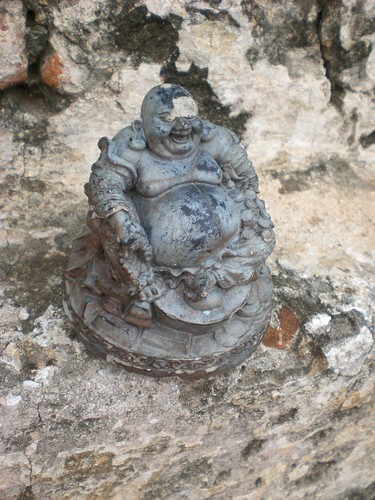 It’s quite sad how a lot of the Buddha images were headless. It’s either because of natural weathering or more likely looters. These didn’t have orange sashes. 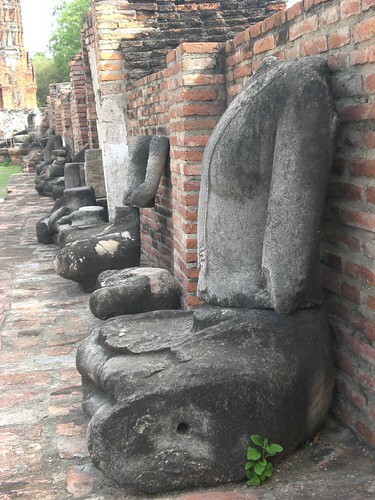 There was also a whole avenue of headless Buddhas, which was startling and strangely atmospheric in its sense of tragedy. 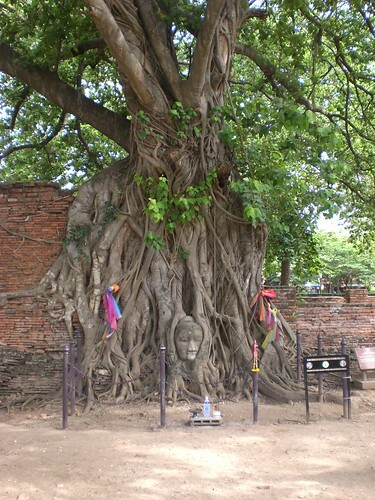 And then the crowning glory of the place: a Buddha statue grown over by a tree. For once the norm was reversed so that only the head could be seen. 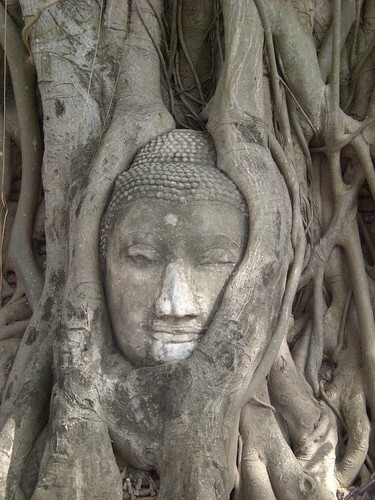 It’s amazing how the tree roots simply took over yet left the head and face untouched.